Painting From Life classes provide artists and students the opportunity to study with award winning Putney Painter, Hagop “Jack” Keledjian. 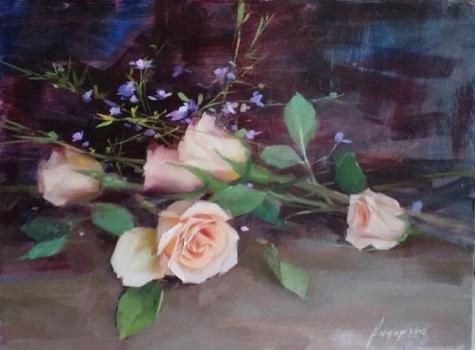 In these classes, participants acquire a taste of the technical, emotional, and intellectual approaches to oil painting from life through still lifes, florals, portraiture and landscape painting. These sessions include demonstrations, 1:1 instruction and critiques. Students are free to work on the topic of their preference during class and receive one on one support from Jack. Though born in Armenia, Jack's early art education in Russia provides a strong foundation in his work and studies with honorable gestures to the Old Master and Impressionist traditions of John Singer Sargeant, Richard Schmid and others. Jack passes along his joyful approach to "painting fresh" from life. Join a serious group of painters to work with on an ongoing basis. similar to The Putney Painters, of which Jack has been a member, and studying with Richard Schmid and Nancy Guzik since 2001. Our Maestro, Richard Schmid, continually encourages students at Village Arts not to box themselves into thinking that you are only a landscape painter, or only a portrait painter. If you understand how to see properly, you can paint anything. Jack’s classes will show you how to see the beauty of the world, whether it is a still life, landscape or portrait, as a mosaic of harmonic color notes. To Register: Please contact the class monitor, JoAnn Denehy <jacksclassvt@gmail.com> for a complete list of class dates.